There are many important greenhouse gases besides CO2: in fact they account for about 20% of total greenhouse gas emissions in the EU. The IIASA Air Quality and Greenhouse Gases Program has developed new methods to investigate the three most important—methane, fluorinated gases, and nitrous oxide—determining how much is released, how to reduce their emissions, and what the costs of this will be. To address this, an IIASA study brought together all available information on the handling of gases released through oil production for around a hundred countries. The team used this to derive global estimates of the volumes of gas flared and vented that are consistent both with country-specific flaring volumes estimated from satellite images, and total generation and recovery of gas taken from energy statistics. Only in Canada have direct measurements of venting been taken, and these patterns were therefore used for all countries. The results demonstrated that methane emissions where much higher than previously estimated . The study also examined ethane, which is a better tracker for these emissions than methane, because it does not last long in the atmosphere, and oil and gas production is its dominant source. Ethane emissions estimated using the improved method correspond remarkably well to top-down atmospheric measurements, explaining much of the existing divergence between bottom-up and top-down estimates . Global oil and gas systems are estimated to have released about 3 metric gigatons of methane over the study period 1980-2012, which will cause the same amount of global warming as about 100 billion metric tons of CO2 over 100 years. For the earlier years, this means more than double the corresponding methane emissions estimated by the US Environmental Protection Agency and Electronic Data Gathering, Analysis and Retrieval databases. Fluorinated gases, commonly used as cooling agents in refrigerators and air conditioners, also have a strong greenhouse effect. They have come under increasingly stringent regulations, including the Kigali Agreement, which was signed by 170 countries in 2016. To estimate the current and future releases of fluorinated gases under the new rules, IIASA researchers developed a tool in the Greenhouse Gas – Air Pollution Interactions and Synergies model. The tool can also be used to estimate the costs for complying with the agreement from 2016 to the phase-out of these gases in 2050 . Methane emissions from global oil and gas systems when using new estimation methodology and in comparison to existing bottom-up inventories from US Environmental Protection Agency and Electronic Data Gathering, Analysis and Retrieval. The third most important greenhouse gas is nitrous oxide, but it is often ignored in climate mitigation measures. Its main anthropogenic source is agriculture, and by analyzing global emissions of the gas from atmospheric concentration measurements, IIASA researchers concluded that under standard agricultural practice biofuel production will typically cause more greenhouse gas emissions in the form of nitrous oxide than it will save on fossil fuel CO2 emissions . Although they are not adequately enforced, laws for the regulation of this potent greenhouse gas do exist. For instance, IIASA research found that the US Clean Air Act provides considerable authority to reduce national nitrous oxide emissions, even though it was designed to address its ozone depleting, rather than global warming, properties . Höglund Isaksson L (2017). 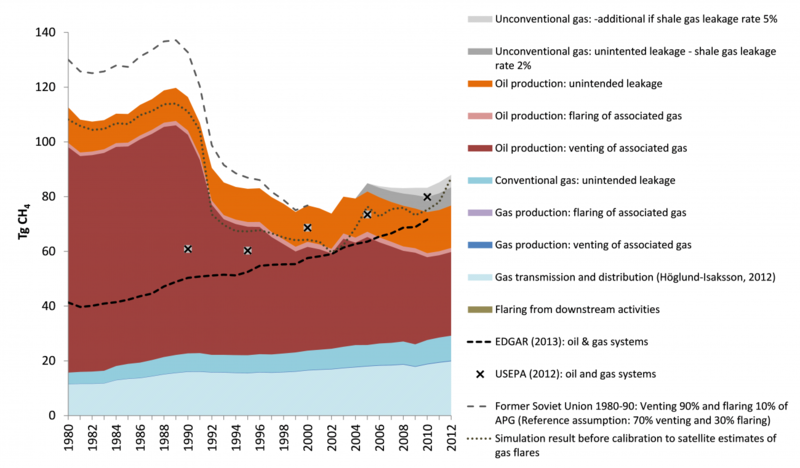 Bottom-up simulations of methane and ethane emissions from global oil and gas systems 1980 to 2012. Environmental Research Letters 12 (2): e024007. Saunois M, Bousquet P, Poulter B, Peregon A, Ciais P, Canadell JG, Dlugokencky EJ, Etiope G, et al. (2016). The Global Methane Budget: 2000-2012. Earth System Science Data Discussions 8 (2): 697-751. Purohit P & Höglund Isaksson L (2016). Global emissions of fluorinated greenhouse gases 2005-2050 with abatement potentials and costs. Atmospheric Chemistry and Physics 17: 2795-2816. Crutzen PJ, Mosier AR, Smith KA, & Winiwarter W (2016). N2O Release from agro-biofuel production negates global warming reduction by replacing fossil fuels. In: Paul J. Crutzen: A Pioneer on Atmospheric Chemistry and Climate Change in the Anthropocene. SpringerBriefs on Pioneers in Science and Practice, 50 . pp. 227-238 Glan, Switzerland: Springer International Publishing. ISBN 978-3-319-27460-7 DOI:10.1007/978-3-319-27460-7_12. Kanter DR, Wentz JA, Galloway JN, Moomaw WR, & Winiwarter W (2017). Managing a forgotten greenhouse gas under existing U.S. law: An interdisciplinary analysis. Environmental Science & Policy 67: 44-51. DOI:10.1016/j.envsci.2016.11.003.